Compliant with IEC 60601-2-2* and fully compatible with products from the leading electrosurgical device manufacturers such as Olympus KeyMed, Erbe, Bowa, Eschmann and Covidien, the Uni-Therm from Rigel Medical verifies and calibrates all major electrosurgical generators while guiding the user through all test procedures quickly, automatically and all safely. The large array of internal resistors, ranging from 0 - 5115Ω, in 5Ω steps, offer not only extremely accurate and detailed power curves but also safe working practise by providing all necessary resistors within a single enclosure. Rigel Medical has produced a guide to electrosurgical testing which is available in April 2013. To obtain a free copy of the guidance booklet email pulse@rigelmedical.com. The Uni-Therm high performance electrosurgical analyser also forms part of a comprehensive range of high performance specialist biomedical test equipment supplied by Rigel Medical. 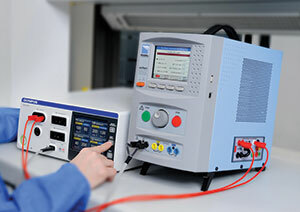 Read more about the Uni-Therm high performance electrosurgical analyser.